This season, women are taking control and showing us how to rock styles with their daring looks. Inspired by striking contrasts, they take on a black and white stylishly modern theme, perfect for showcasing their hair's strength! On trend from their roots down to the tips, they are rocking the fiery side of their red locks, the intensity of their blonde colour or the mysterious depth of their brown hues. Still with a rock chick rebellious vibe, they are opting for bolder cuts than ever: Whether A-line bobs, full long locks or on-trend layers, women are daring to try out anything. This also goes for styling, with elegantly blow-dried haircuts, spectacular wavy styles or maximum volume with couture backcombing. Not to mention the surprising new Style Bar updo: the double braided ponytail. At Jean Louis David, men have most definitely not been left out! 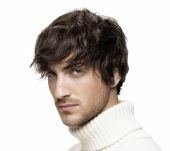 With a layered haircut, they have a multi-faceted look. What with blow-dry styling for a 'boy-next-door look', an on-trend retro style or a bad boy rock quiff, it is down to them to choose their style for the day! Are you ready to do the same thing and discover your Double Me?